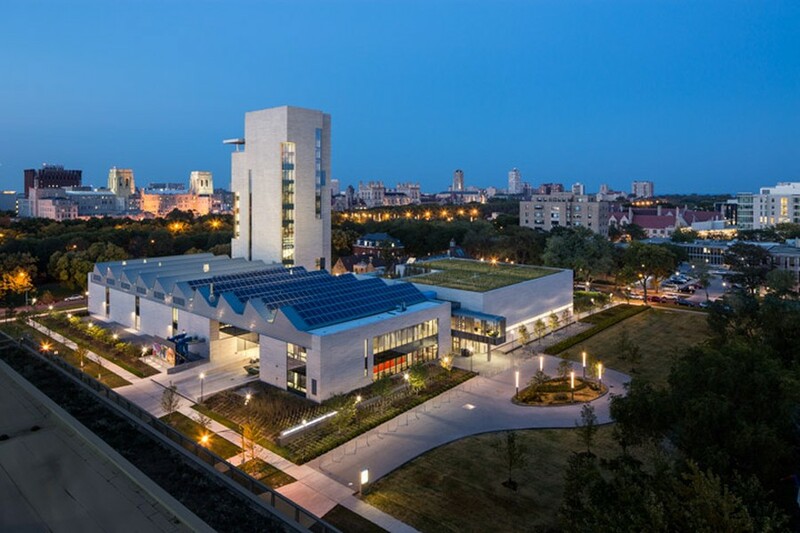 The Logan Center was one of several buildings honored with a 2017 National Architects Honor Award. The Logan Center was conceived more than 15 years ago to answer a challenge: What can be done for the arts at the University of Chicago? A report compiled in 2001 by then-provost Geoffrey Stone with input from faculty, staff, and architects yielded two important yet conflicting declarations that demanded resolution. First: the arts are integral to an effective liberal arts education, and students at the University are interested in pursuing them. Second: current arts facilities on campus are scattered, poorly maintained, and generally inadequate. As early as 2001, there was talk of a consolidated arts space on East 60th Street and South Drexel Avenue to bridge the gap between Mandel Hall’s immense 985 seats and Fulton Hall’s more intimate 150. Guided by a firm commitment to honor and protect arts as a liberal arts institution, the University aimed to create a unified space dedicated to the practice and process of art. With this commitment in mind, the administration turned to the monumental task of financing a space that would include, at minimum: two theaters, triple the number of practice rooms, storage facilities for props and other materials, and open spaces for collaborative projects, receptions, and entertainment. It was not until 2007 that the University received a $35 million donation from David and Reva Logan, arts patrons and University alums. Plans for construction were finalized with a staggering budget of $114 million. New York firm Tod Williams Billie Tsien Architects ultimately won the contract to design a space that could fit needs as complex as those of Logan. 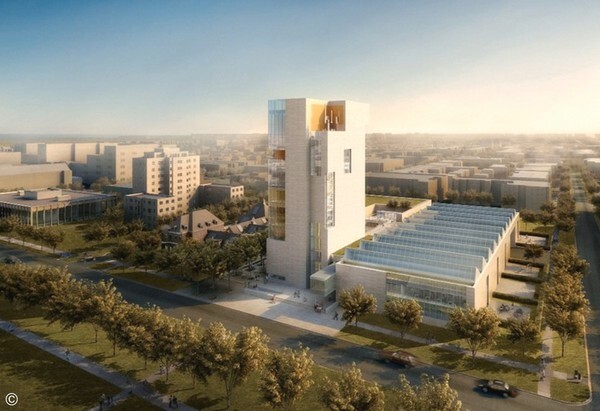 They proposed a tower of Missouri limestone as an homage to the Indiana limestone of the neo-Gothic quad while the tower recalled the classic Midwestern grain silo. The large stone slabs on the building’s exterior also reference Frank Lloyd Wright’s Robie House. The architects envisioned collaborative spaces where students could practice their art under natural light from skylights and huge windows. As visions of the University and the architects coalesced, leadership from the Music Department, University Theater, the Visual Arts department, and other groups that would occupy Logan began meeting with contractors and architects to arrange the spaces according to their needs. “When we were actually building the building or drawing up the plans we had just endless meetings. It was a long, long process,” remembered Barbara Schubert, director of the Music Department. Negotiations were hindered by budget concerns, which led to a smaller building with more limited storage space. Yet the process pressed onward. Conceptions of the Logan Center as an art space, collaborative hub, and venue for outreach were finalized in one plan and construction began in 2010, nine years after the building was conceived–a remarkable turnaround time for a project of this magnitude. With the design process underway, conceptions of what the space could be were challenged and expanded. The administration, reflecting growing concern for the University’s broader role in South Side communities, reoriented its focus from solely supporting the arts to expanding venues for community engagement. 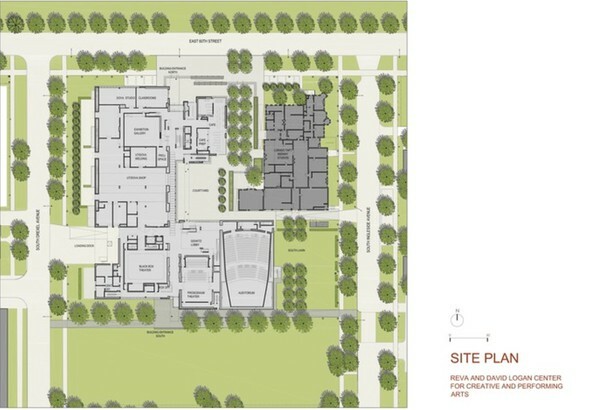 Plans were adjusted to include doors on both the north and south sides of the building, a symbolic welcome to non-University communities south of campus. Despite occasional hiccups, construction was completed in 2012 and the building celebrated its opening festival October 12–14. It combined outreach and arts in one place that might provide the University with a legitimate claim as an arts-respecting and philanthropic institution. Whether it would pan out as hoped would be another matter. More than 60 arts RSOs use Logan's variety of performance and rehearsal spaces. Now, Logan is a hub for artistic endeavors from the student and wider South Side communities. Bill Michel, executive director of the Logan Center, confirmed the center’s mission to provide practice and performance spaces, project funding, technical support, and resources to student groups on campus. “[A] diverse range of student groups...have created terrific work in the Logan Center,” Michel said. Fire Escape Films uses Logan’s camera equipment to produce original films, while other spaces in the building are home to Le Vorris & Vox Circus’s open practices and Kitchen Sink’s weekly painting sessions. Most recently, dance groups showcased their choreography at Where Fun Comes to Dance, and a cappella group Voices in Your Head will sing in the Performance Hall next Friday. The University Chamber Orchestra, Middle Eastern Music Ensemble, and other groups also rehearse and perform there. “We couldn’t exist in the performance program without it,” Schubert said of Logan. Aside from working with over 60 campus groups, the Center also collaborates with local organizations and initiatives to bring arts to Hyde Park. Logan has hosted citywide events like the Chicago International Puppet Festival and Chicago Symphony Orchestra. It also regularly features the work of local and international upcoming artists—this year, it hosted an exhibit of Canadian artist Kapwani Kiwanga’s work and panel events for the Brooks Centennial. “It has become a center that celebrates artistic practice and encourages collaboration between our students, faculty and many South Side and city-wide artists and arts organizations,” Michel said. Logan also hosts 500 graduate and undergraduate classes each year, from creative writing to visual arts, while also providing arts education opportunities to the wider Chicago community. “We have supported the development of new artistic work including new music compositions by Ph.D. composition students, work by M.F.A. and B.A. students in the Department of Visual Arts (DOVA), [and] the development of new plays through TAPS,” Michel said of the center’s support of student academic work. At the same time, more than 175 public schools work with Logan through programs such as the K-12 School Matinee and Logan Family Saturdays, which bring 10,000 school children to the Center each year. Partnerships with the Hyde Park School of Dance and the ASE Youth Ensemble help nurture a new generation of artists. Some have taken issue with a few of Logan's design eccentricities, such as the conspicuous lack of bathrooms on every floor. Meant to encourage exploration, this design feature often proves an inconvenience more than anything else. Schubert, who was deeply involved in the process of getting Logan off the ground and sculpting it into its current form, has her reservations about the building’s final structure. “One [potential] configuration had a whole group of practice rooms together and a lounge for music department students...that was in the plan. But then, budget cuts,” Schubert said. The current design, she says, does not emphasize collaboration in the way that the architects and University consultants, herself included, and envisioned. Her office, deep in the recesses of Logan’s second floor, is inaccessible to students; she no longer has casual student visitors like when she worked in Goodspeed Hall. Practice rooms, small and individualized, are meant for solitary work that does not reflect the building’s original collaborative intentions. These intentions have also been limited in part by the building and in part by what Schubert sees as a lack of motivation on the part of members of different arts departments. There has been little overlap in the past five years, with most branches remaining insulated in their respective sections of the building. Music and theater, a natural pairing, have hardly worked together. Scattered studio spaces originally intended to facilitate group work have instead encouraged pockets in the building with different focuses, separating the resources of the different arts divisions without necessarily expanding collaborative focus. The building has also seen its fair share of construction problems, including notorious leaks and broken elevators that have led students to question the structural and architectural integrity of the building. The black box theater, for instance, was designed with skylights, limiting the ability of student productions to employ lighting effects during daytime shows. There aren’t bathrooms on every floor, which fourth-year Natalie Wagner said was meant to encourage exploration of the building, but often presents challenges to accessibility and convenience. “The Secret Service really didn’t want them to explore!” she joked, referencing Obama’s recent visit. Hallways have presented further inconveniences. Many of them are huge, and much of Logan’s vertical space is devoted to large stairwells, part of compromises necessary in allocating space to different departments in competition for limited resources. Even so, Logan has swiftly become a home for campus arts, a dazzling constellation of different performance and creative groups. It supports a thriving ecology of music, theater, and visual art. Despite limitations to storage and collaborative ability, performance groups across campus have grown and diversified as a result. For a university that is sometimes willing to rest on its laurels, making grand statements about a commitment to principle without taking confirmatory action, the Logan Center is a refreshing change of pace–a commitment to a noble vision to achieve a very plausible conception of what the liberal arts ought to be.